A man who camped on Snowdon as part of preparations for a Norwegian ice climb had to be rescued after becoming exhausted. The 55-year-old from Norfolk called for help after a night on the mountain 500m (1,640ft) up at the Bwlch Cwm Llan. He sat out a spell of bad weather but hadn’t enough strength to make his own way back down with his rucksack and tent. Llanberis Mountain Rescue Team was alerted and Sea King helicopter from RAF Valley went to his aid. The mountain rescue team carried him to a site from where he could be airlifted. He was taken to the Ysbyty Gwynedd in Bangor but discharged after medical checks. The unnamed man expressed his gratitude to the rescuers for getting him off the mountain. 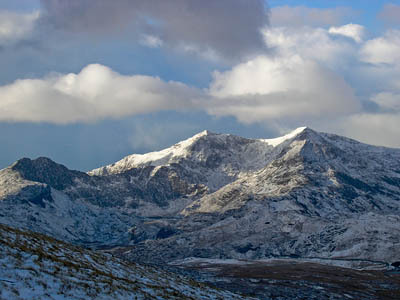 Ian Henderson of the Llanberis MRT warned many parts of Snowdon have become prone to avalanche in the prolonged period of winter conditions.